The kibbutz was established in October 1946 – the original name being Kelta. We were a young group of girl and boy scouts (Tzofim Gimel – in Hebrew) who were located at two kibbutzim in the Jordan Valley, Degania Aleph and Afikim. We were joined there by a group of young immigrant refugees who had come to Palestine by way of Iran and were known as “The Children of Teheran”. There we all received agricultural as well as military training in order to serve together in the prestigious Palmach division of the Haganah ground forces. As was the custom in those pre-state days we were due to work in one of the small settlements (Moshavot) and await our turn to receive land on which to settle. However these plans were changed with the publication of the British White Paper which restricted Jewish purchase and settlement of land. 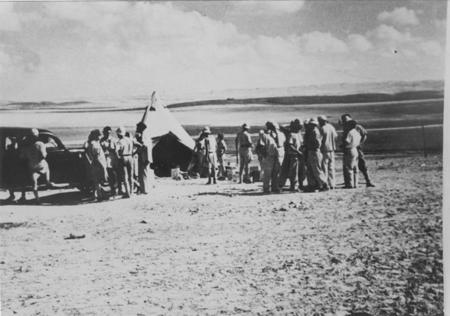 As we were making final arrangements to leave the Jordan Valley we were told that we would be one of eleven groups that were targeted to settle immediately at one of the strategic points in the Negev during the hours of darkness in October 1946. Our original group (gar’in) was comprised of five young woman and 25 young men. The enthusiasm was high and didn’t even drop when we discovered at daybreak that our new home was simply a barren hill in an expansive desert area with only a single acacia tree to be seen against the horizon. During the first year we worked at various jobs outside of the settlement, the most important being the laying of a six inch water pipe from the area of Gvar’am/Nir’am, two kibbutzim about 60 kms north of Hatzerim. A year after our arrival we received our first water supply and immediately began preparing the land. The water in the pipe brought us joy but our future in agriculture was still uncertain as all we had were 600 dunams (150 acres) of cultivatable land. Our efforts to use the water for agriculture were crushed with the passing of the UN Resolution on 29th November 1947 calling for the establishment of a Jewish state in part of Palestine. This caused a wave of Arab rioting and terror including the cutting off of the pipeline carrying water to the Negev settlements. We remained without piped water until the end of the War of Independence. However we realized that our settlement served an important political purpose as it brought about the UN recommendation of including the entire area south and west of Hatzerim within the borders of the future Jewish State. During the War of Independence we were an outpost settlement defending ourselves and serving as a springboard for the conquest of Beer Sheva and later for the liberation for the whole of the southern Negev. With the end of the war we again turned to agricultural activity. We no longer had a problem of lack of land as great expanses were now available to anyone prepared to cultivate them. The water pipeline was quickly repaired and once again supplied us with running water. The land was irrigated, seeds were planted and we anxiously awaited the first crops but they did not come. Investigation over a three-year period revealed that the soil on which we had settled was saline and not suitable for agriculture, at least not by conventional methods. Season after season we met with disappointing results but found no suitable solution to the problem. During those early years our first children were growing but the problem of educating a small number of children brought home to us more than ever the reality of our isolation, far away from other kibbutzim. The problem of the saline soil and our disappointments in agriculture along with the feeling of isolation caused us several times to express doubts about remaining at this site. However during those difficult and soul searching deliberations it became clear to us that the problems of soil salinity affected not only Hatzerim but also most of the lands in the Negev, east and south of us. We had already gained ten years of experience in dealing with this problem and we knew that there were few other farmers who had the experience and know-how of our members and who could contribute to solving the problem and enabling this expansive area to be settled. So this realization plus the determination of the authorities for us not to move brought us to a decision to remain here and find a solution to the soil problem. Today we all know that this was a wise decision for in the following two years we successfully flushed the soil, brought in suitable crops and to our joy began to see results. Our settlement now had an agricultural base, which could economically support its members. Standing on the same hill where 60 years ago you could only see a dry wilderness, now you see a mosaic of cultivated groves, gardens and trees. Where before you smelt the dessert dust now you smell the scent of flourishing fields and you hear the sound of tractors and the laughter of children in place of the lonely whistle of the dessert wind. Our rapid growth and development however created a problem of manpower. Despite the constant flow of new members from the Israeli Scout Movement (Tzorfim) we decided to absorb new immigrants from the Zionist youth movements in the diaspara. We made contact with Ichud Habonim in South America, subsequently our first emissaries (Shlichim) went to Argentina in 1962 and our first future members from that country started to arrive in 1965. Today they number about half of our membership, their integration into Israeli society is complete and their contribution to the economy has been great. We cannot imagine our community without them. In 1990 Hatzerim was chosen as the target settlement for the Brazilian youth movement Habonim Dror. Various groups from that movement stay, learn and work with us as part of their educational program in Israel. Graduates from the movement who decide to make Aliya consider Hatzerim as their base from where they can continue their higher education. The first immigrants from Brazil are already members of the kibbutz and the numbers are increasing. The business developed more rapidly than even our greatest expectations. 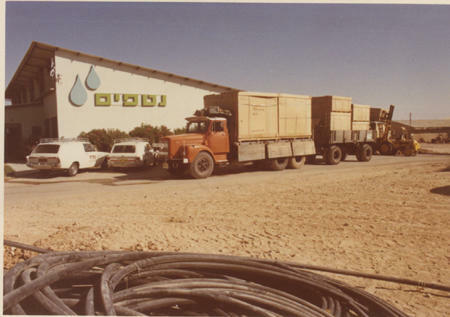 Netafim pioneered drip irrigation in the sixties and is today Israel’s leading producer in that field as well as being a world leader in the development of modern irrigation methods. Netafim in Israel is comprised of three manufacturing plants at three different kibbutzim, Yftach in the north, Magal in the center and Hatzerim in the south. Netafim has 17 production factories around the world in which more than 4,000 workers are employed. Drip irrigation usage saves water and fertilizers and gives considerably greater yields, thus contributing to the environment and to the need to increase food production in the world. Farming on the kibbutz has been greatly reduced lately and our agricultural side now consists of the milk farm (300 dairy cows) and jojoba plantations. Jojoba Israel is a relatively new industrial venture established by the kibbutz to extract oil from jojoba beans, which is exported for use in the cosmetics industry. There are now thousands of dunams of green Jojoba plants growing around the kibbutz, irrigated with Netafim drippers and treated sewage water. Oil is extracted from the Jojoba beans in a modern fully automatic plant on the kibbutz. Jojoba Israel is the leading company in Israel and throughout the world in producing and selling Jojoba oil. The company was established in 1990 in Kibbutz Hatzerim in the Negev of Israel. From the start the company applied methods of growth which had been developed by the scientists of the Negev Institute of Research as well as their research in a variety of Jojoba species. Since then there is continuous research being done by the Israel Jojoba's team of agronomists as well as development of Jojoba species. The oil is actually a liquid golden wax. It is produced by cold pressing of the seeds of the plant which have been meticulously chosen. The procedure is completely automatic to make the oil pure, natural and of the first rate quality so it can be an important component in the luxurious cosmetic industry. The company applies an environmental preserving policy and uses water saving systems and technologies, agricultural machinery to save manpower, and does not use pesticides during the growing of the seeds. The company is obliged to improve constantly and efficiently its production systems including SO9001-201 and GMP-ISO22716 qualifications. The Jojoba oil was acknowledged by the cosmetic manufacturers as an active advantageous component in products used to protect and care for the human skin, hair and fingernails. In order to meet the growing demands for the Jojoba oil, Jojoba Israel has planted many Jojoba plantations all around the kibbutz and the Negev. A new modern factory to extract the Jojoba oil was built in 2017 in Kibbutz Hatzerim to be an important factor in its way to meet its establishers' vision. influential factor in the Jojoba market in the world. We are obliged to supply Jojoba oil to all the world, everywhere in the world, in the place and time it is needed. Since 2015 Jojoba Israel sells 98% of its production abroad through Jojoba Desert whose offices are located in Kibbutz Hatzerim. Jojoba Desert is the selling\marketing arm both of Jojoba Israel and Desert Oil. The Jojoba oil is exported to many countries where the big world cosmetic industries are like the USA, Germany, France, China, Japan, Spain and others. Within the company is a research and development department that is working hard to develop new products using jojoba wax and using the jojoba wax as a raw material for the world cosmetic industry. Jojoba Desert is building the market that enables it to bring the message of quality natural ingredients to the cosmetic world, to promote and lead the branch in the world directly from our blooming Negev. Other profitable branches of the kibbutz are the dairy farm, the law offices, a craft shop, kennels, dancing academy and others. Many kibbutz members now work outside of the kibbutz in their profession and their salary contributes to the kibbutz economy. Our entire economy is based on the work of more than 480 members and in total there are about 1000 people who live on the kibbutz. Some children born on the kibbutz have already become members while others have left and chosen a different way of life. A large number of our children who have left school are currently engaged in various activities. higher education or working on the kibbutz while they decide what they want to do. 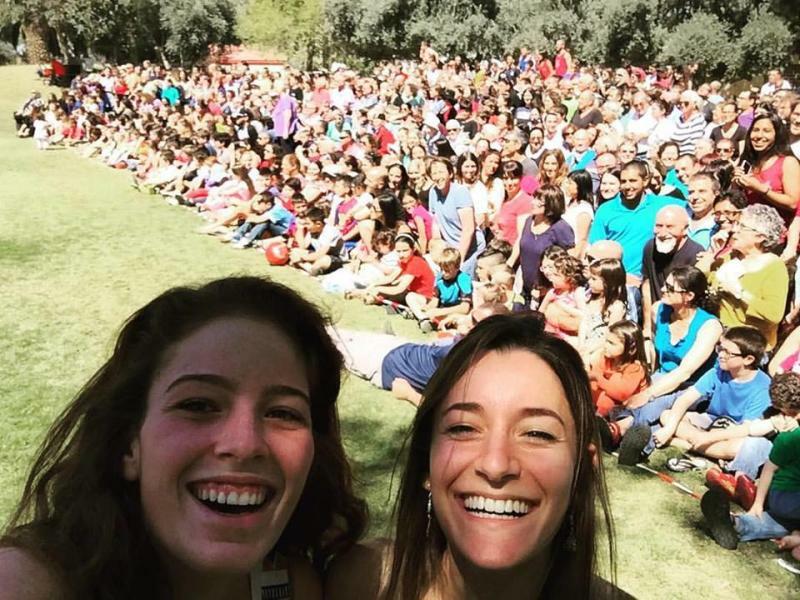 The kibbutz grants its children 15 years of education. At present there are about 270 children up to the age of 18, at which age they are due to enter the army. Our kibbutz elementary school is a local school dedicated to the promotion of the values of community, nature and art and our high school students study at the nearby Eshel Hanasi Regional Comprehensive High School. Since 1978 our children up to the age of 15 sleep at home, after that if they wish they can transfer to the youth area . Hatzerim today is a multi generation community, with members, children, grandchildren and we have been joined by retired parents of members from Israel and abroad. The founding members have reached retirement age but still contribute where they can to the kibbutz. The kibbutz has set aside appropriate savings for pension funds and for grants to children who decide to leave the kibbutz. 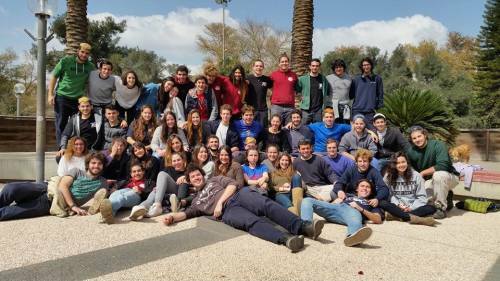 As a kibbutz with many graduates of the scouts and of Habonim Dror we take an active part in the ongoing educational work of these movements including sending educational emissaries (shlichim) abroad. During the seventies and eighties we adopted and helped two young kibbutzim during their early days, Ketura in the Arava valley near Eilat and Har-Amasa in the Hebron area. Together with a group of educators we helped to establish Kedma, an educational youth village situated about 80kms north of us. Our most significant on-going social undertaking is the absorption of Israeli youth within the framework of Youth Aliya. Four such groups have completed their high school education with us since 1976. Our modern dining room is need of extension, there is a modern laundry, sports stadium, a small performance hall, a small supermarket for everyday basic needs, social club for meetings and cultural activities, a functional pub, nursing care centre for whoever is in need etc. 1. mutual ownership of the assets. 2. personal budgets according to family size and needs, preventing any kind of differential income. contribute to the welfare of the kibbutz. The kibbutz is obliged to develop sources of suitable employment for all of its members. Kibbutz Hatzerim is located about 8kms west of Beer Sheva in a relatively arid area with an average rainfall of up to 180mm., there have been years of drought when the rainfall did not even reach 100mm.